My daughter (like so many children) loves to draw and create. She is constantly presenting us with her artwork and loves to see it displayed. We used to put it up on the fridge. We found a few problems with this. Our baby, who is now mobile, seemed to enjoy removing the artwork that she could reach. This was upsetting for our older daughter. The baby also loved to eat the artwork. This was upsetting for both my daughter and me. I knew I had to come up with a different solution. The fridge was cluttered and art was falling off every time we opened the door. I found these cork board tiles at Walmart and I knew that they would be perfect. The wall in our dining room was completely blank and I had not yet found anything to adorn the room. I put the tiles up and I have attached my daughter's art to the tiles. She is so proud to see her art on our walls and I like that it seems to give her art an organized way to be displayed. 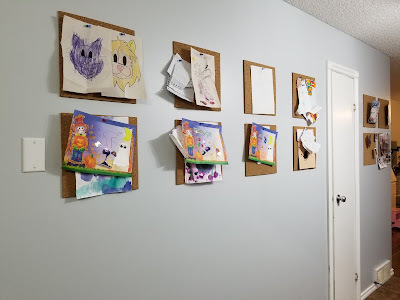 How do you display your children's artwork? I would love to hear your ideas!